There is a world’s oldest library. Now part of a university, it is the Al-Qarawiyyin library in Morocco. Founded in 859CE by a lady called Fatima al-Fehri, it contains ancient and mediaeval manuscripts as well as books. It has recently undergone a major restoration with special moisture management systems installed to protect the precious manuscripts. Apparently the Library of Congress celebrated its birthday recently. On April 24th 1800 then president John Adams parented the library by approving the necessary expenditure. I doubt if it got a cake with 217 candles on it, but its anniversary was marked in several places, including a collection of trivia from Bookriot. Some libraries use unique classification systems. The Levinski Garden Library shelves its books according to the emotions they raise in their readers. Each reader is asked to describe the book’s effect: sad, happy, boring etc. The emotions are colour coded and the returned book gets a piece of coloured tape and is then shelved according to the most recent one. I never knew there are special literary archives. What a treasury! I’m also amazed at the quantity of material some archives hold. I hope anyone in the Manchester area gets a chance to visit the exhibition described here. GLAM – the Group for Literary Archives and Manuscripts – celebrated its tenth anniversary in October with a meeting at the John Rylands Library in Manchester. The Fitzwilliam Museum is a member of GLAM due to its fine holdings of literary manuscripts, including autograph manuscripts of Keats’s Ode to a Nightingale, Thomas Hardy’s Jude the Obscure, and Virginia Woolf’s A Room of One’s Own. GLAM’S aim is to support all forms of literary archives and it unites professionals working in a variety of institutions: national bodies (The National Archives), universities, museums, local authorities, and special repositories. With such a wide base of members, it is ideally placed to provide a support network for professionals working in the field of literary archives and one of its most significant achievements has been to produce cataloguing guidelines and a thesaurus. To me it sounded like a cross between the title of a fantasy novel and a line of Anglo-Saxon alliterative poetry. It also seems mysterious and enticing – I’d never heard of dark archives and I imagined librarians creeping between long shelves of ancient books lit only by a guttering candles (too much Harry Potter here, perhaps). Actually dark archives are, according to Webopedia, data stores not generally accessible. Access is either restricted to a few people or completely denied. Their main purpose is to act as a back up during disaster recovery. A sensible precaution for any organisation. The Analytical Access is a project of the British Library and several other academic organisations. This common sense description doesn’t reduce their mysteries. I’d love to know how many there are, what’s in them, who has access to them, who created them. I bet the CIA has a huge one. Ditto other security services. Then there are the digitisation programmes of major libraries. And don’t companies have them? What will become of them in the long term if only a few people can care for them? Will they float forever in the electronic ether, lit only occasionally by the computer of a visiting historian? Or will they fade slowly into nothing? If their creators die without telling anyone the passwords, will armies of hackers have to work them out? Or will they just be deleted? One of the e-newsletters I subscribe to is from the British Library. They remind their readers that there are only a couple of weeks left of their major exhibition on Mughal India. The Gulshan Album (Muraqqa’-e Gulshan) described as one of the world’s greatest books, was originally assembled for Prince Salim, the future emperor Jahangir (r. 1605-27). What could be more enticing? I love the idea of assembling rather than writing a book. A bit like blogging where one assembles pictures, videos and links to make a post. Yesterday the BBC TV news carried two literary-related items. Yesterday marked the 200th anniversary of Jane Austen’s Pride and Prejudice. 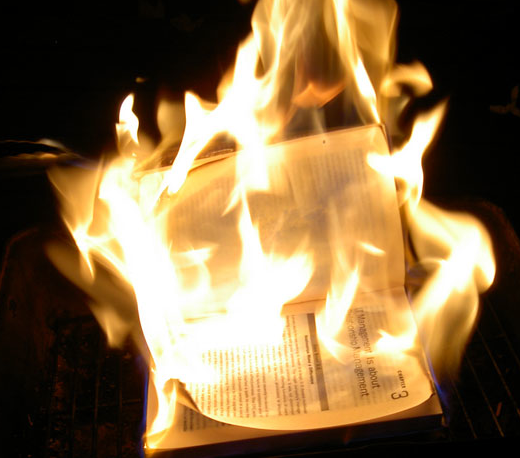 Yesterday the French army seized Timbuktu, only to discover that a library of ancient manuscripts had been burned and most of the books destroyed. What a contrast! The peace of English village life/the violence of war; a book loved/books destroyed; appreciative readers celebrating/an act of childish spite. The arsonists have achieved nothing but to rob the world of a treasure, and to weaken an age old connection between the local people and their ancestors. I sometimes think of books as links in a chain joining the past to the future via the present. The chain is anchored in the past when the book was first made and its links uncoil into the future for as long as it’s remembered. Each generation adds a new one. If the book still exists the links are strong, but once it’s gone the chain depends on human memory to keep forging. Memories of some of those old scholars who built the library and wrote the books will start to fade. They do not deserve to be forgotten. Austen however goes from strength to strength and this year will be celebrated all over the world. While attempting to organise some of my books, I came across this one. I’ve owned it for some time and have read it before, but now, re-reading it I was thrilled all over again. 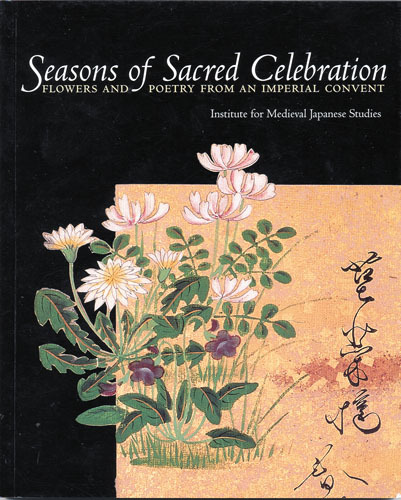 It presents a set of poetry cards from the Diashoji Imperial Convent in Kyoto. Each card is reproduced on its own page and opposite are a Japanese and English version of the poem. The publishers are the Institute for Medieval Japanese Studies, part of Columbia University, New York. The book is beautiful – the illustrations are magical; the poems show new ways of looking at flowers and trees; the scholarly introduction and essay are fascinating – I learned an amazing amount; the index to the calligraphers is well organised and useful. And there is a mystery – who initiated the production of the set of cards and why? And they are part of women’s Buddhist history and were published to celebrate a great woman, Zen Abbess Mugai Nyodai (1223 – 1298). The cover art is from Floating World Editions.